Briksdal Glacier is one of the few European glaciers not constantly receding—the size changes depending upon temperature and precipitation. Between 1935 and 1951, the glacier receded 800m and exposed the lake below, but from 1967 to 1997 it expanded and covered the whole lake and was the only glacier in Europe that was expanding while all others were receding. 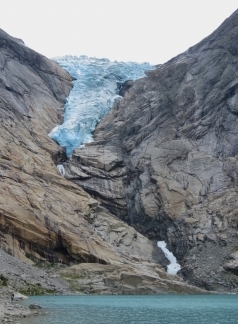 The glacier has mostly been receding since 2000, but grew again in 2010. 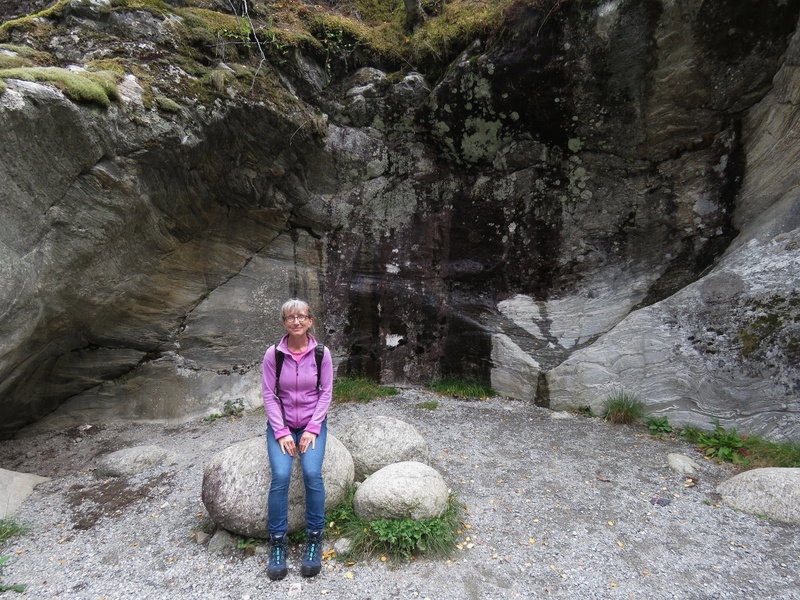 We made a one-hour bus ride from Loen through beautiful mountain scenery to the Briksdal Glacier trailhead, then walked 45 minutes through even more dramatic scenery to have lunch at the glacier. The 666ft (203m) AIDAvita arriving into Olden this morning. Our anchorage below Mt. Hoven. 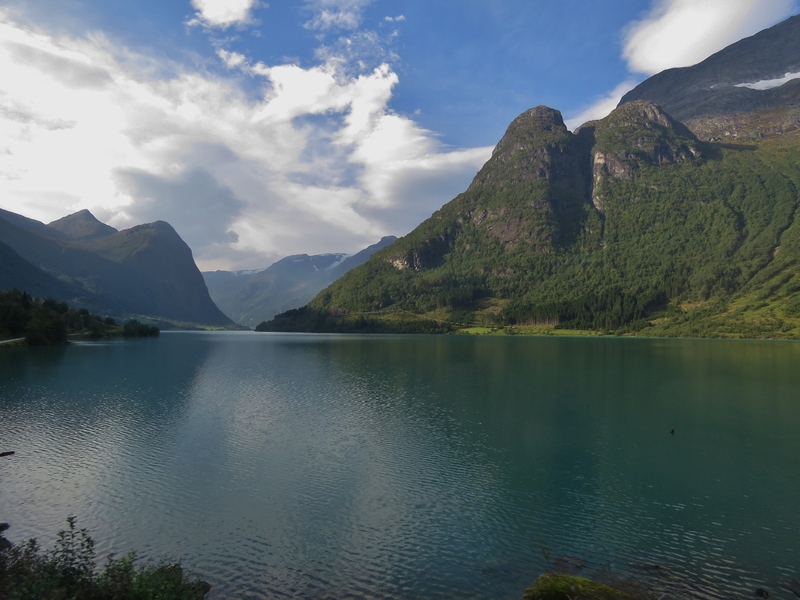 You can just make out the top of the Loen Skylift at roughly center of the picture (click image for a larger view). 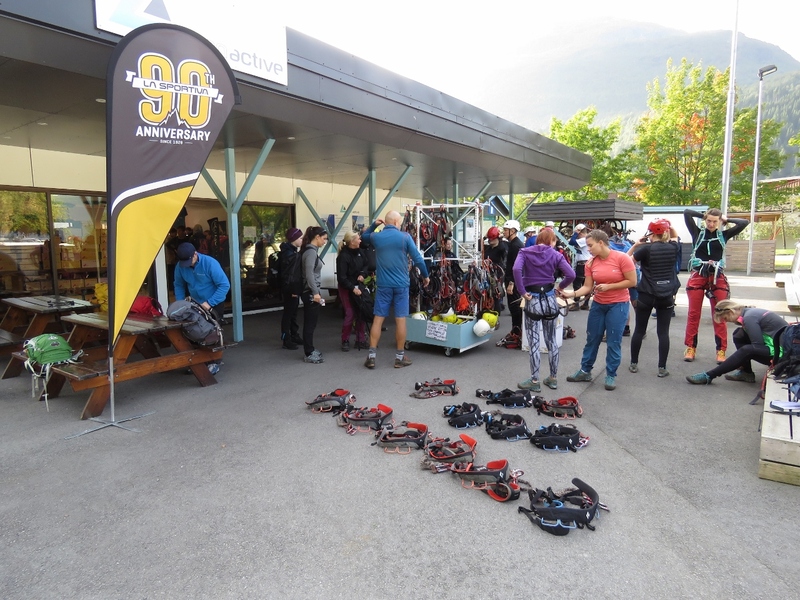 Several dozen climbers were getting ready for a guided tour on Via Ferrata Loen with Loen Active. 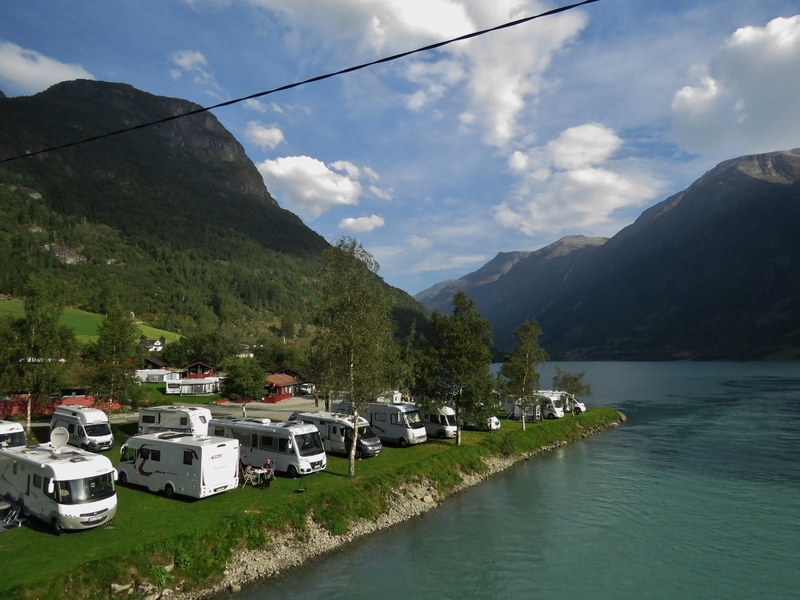 We’re in town to take the bus to Briksdal Glacier and the bust stop is near where the paragliders land after taking off from the top of Mt. Hoven. 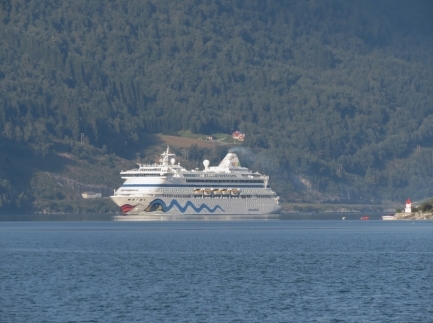 Lots of activity in Olden with the cruise ship AIDAvita in port. The public bus we’re to Briksdal glacier runs daily until the end of August and after that only on days when the cruise ship is in town. 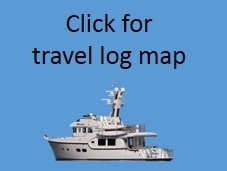 We wondered why, as the cruise ships normally run their own buses for shore excursions. But at least a dozen passengers got on in Olden. 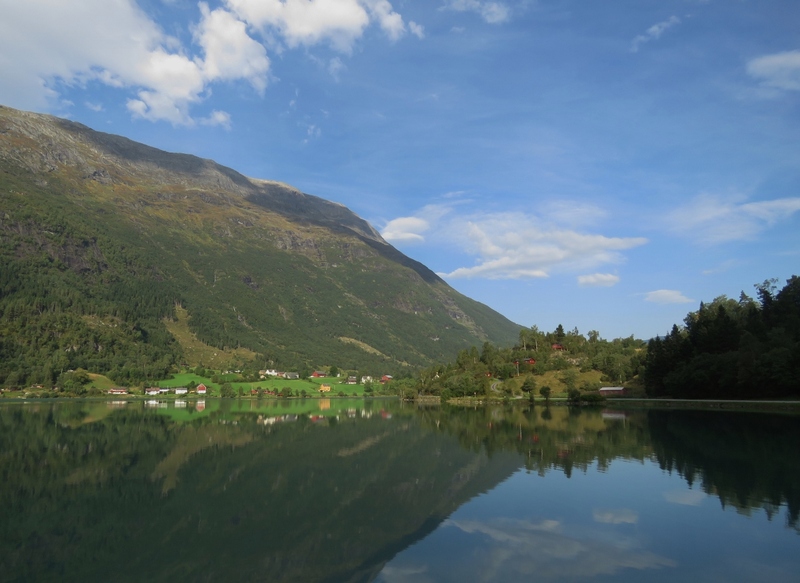 Apparently nobody takes the bus from Loen on cruise ship day—the driver went right past both highway exits for our stop and had to back down the highway when he noticed us at the stop after he’d passed. We were lucky he stopped. The sunny morning reflecting in the still waters at the north end of the lake Oldevatnet. Looking across the lake Oldevatnet to 3221 ft (982m) Klovane with a near-matching adjacent peak. It’s easy to see why this campsite is so popular—the scenery is spectacular. 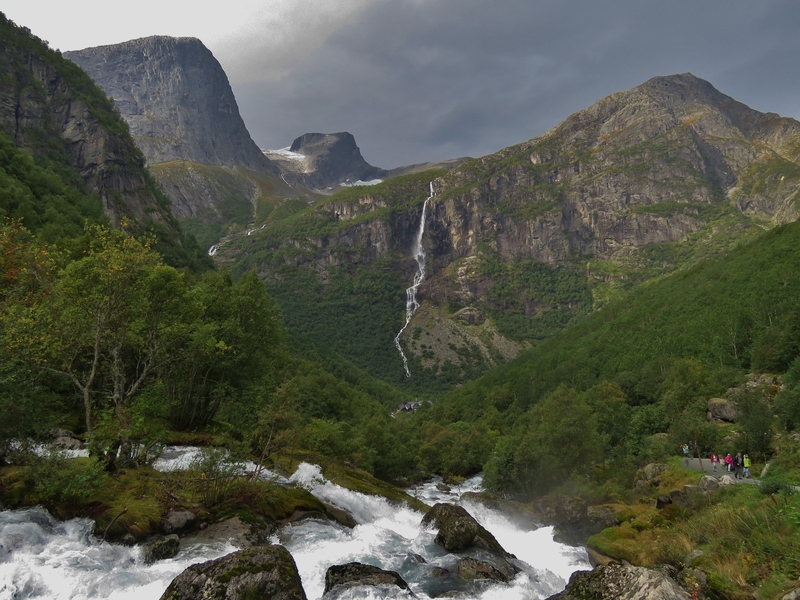 Most of the descriptions of Briksdal glacier focused on the destination itself with little mention of the beautiful scenery en route. This is just one of many waterfalls we saw along the way. 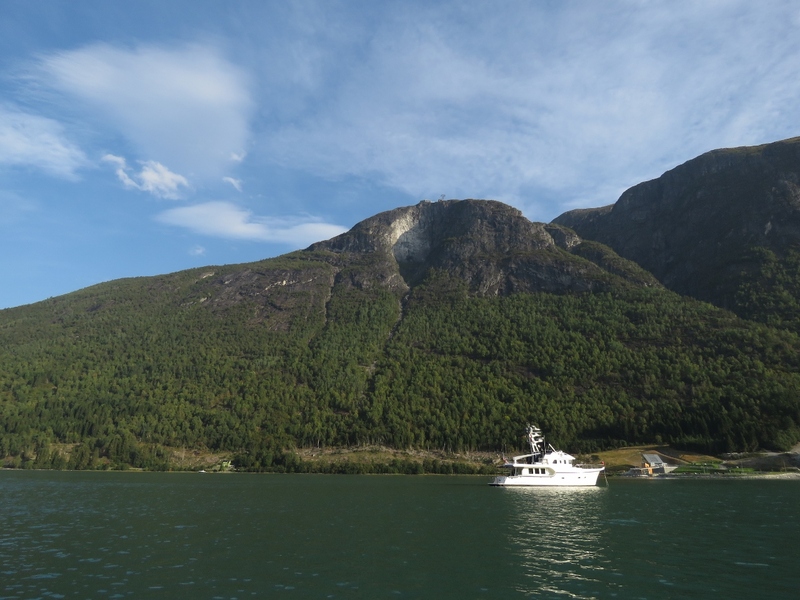 We arrived at Briksdal behind a half-dozen tour buses from the cruise ship. 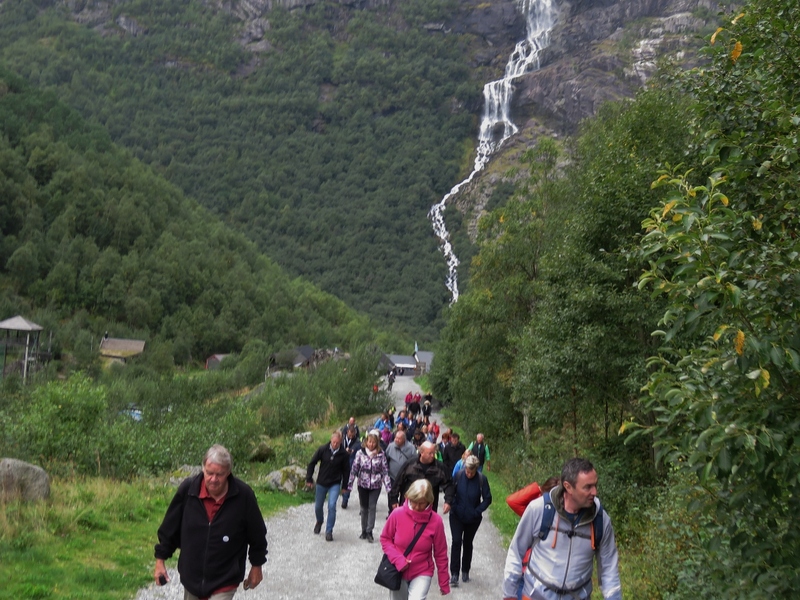 This is looking back behind us as we start off on the 45-minute walk from the parking lot to the glacier. 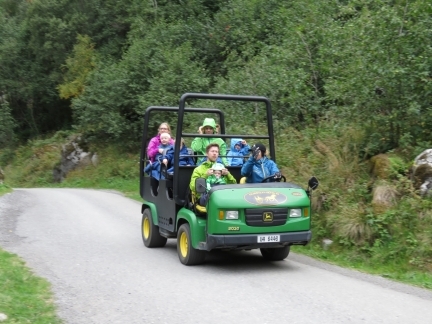 If you don’t want to walk to the glacier you can ride one of these “Troll Cars” for a fee. The Troll Cars use the same reliable power as Dirona—nothing runs like a Deere. Looking back along the river Briksdalselva with the waterfall Volefossen in the distance. 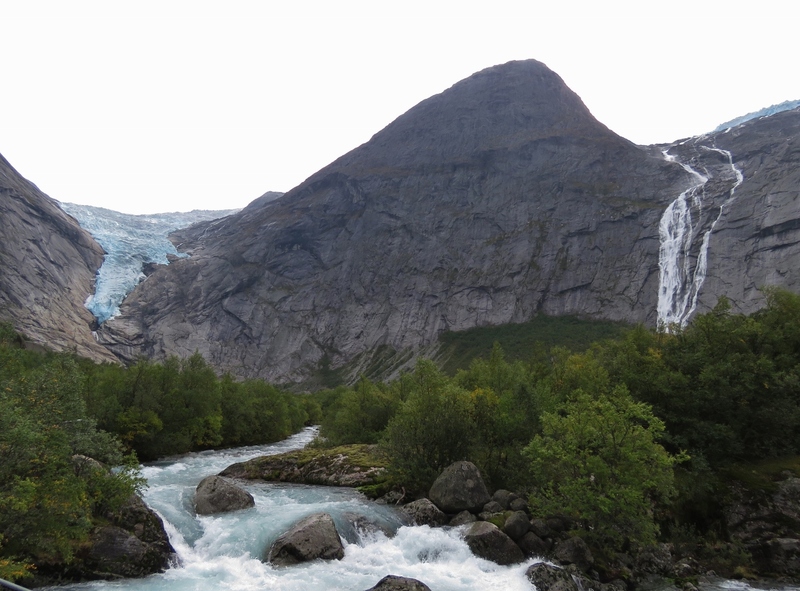 At this point we would have been happy enough with the trip and the scenery even if we didn’t get to see the glacier. 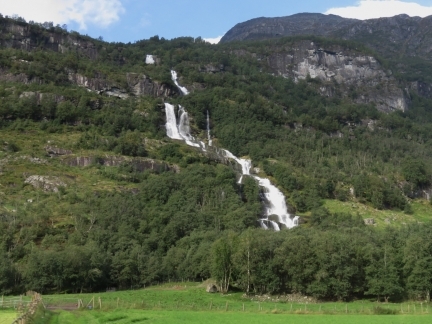 The waterfall Kleivafossen with Briksdal glacier visible in the distance above. Jennifer sitting in a huge pothole. Melt water under high pressure from the glacier above put stones in motion below, forming round depressions and leaving behind smooth stones such as the ones Jennifer is sitting on. 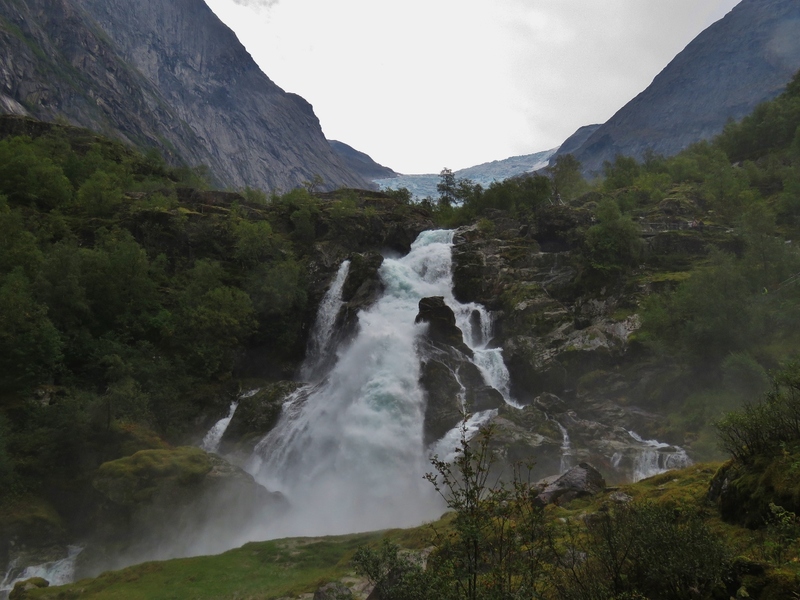 Briksdal Glacier on the left with the waterfall Tjotaelva on the right. Briksdal is another tongue of Jostedalsbreen icecap that we saw from the south in May when we were in Fjaerland. Briksdal glacier is not constantly receding— the size changes depending upon temperature and precipitation. 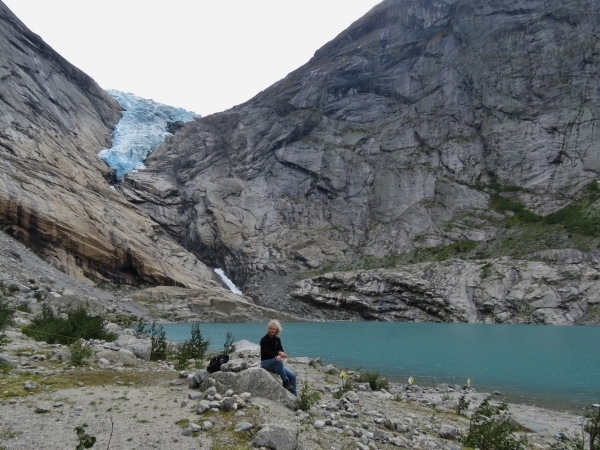 Between 1935 and 1951, the glacier receded 800m and exposed the lake below, but from 1967 to 1997 it expanded and covered the whole lake and was the only glacier in Europe that was expanding while all others were receding. 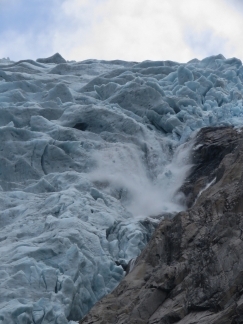 The glacier has mostly been receding since 2000, but grew again in 2010. 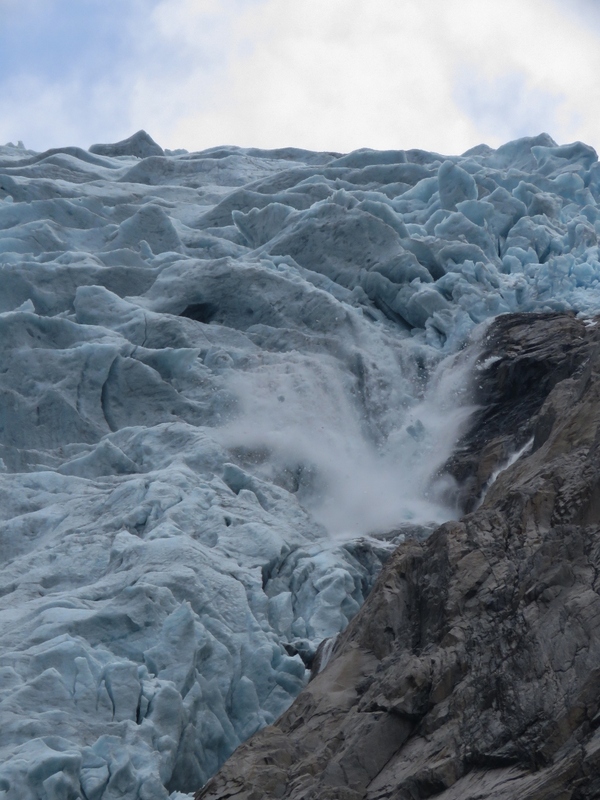 We were lucky to witness a huge chunk of ice falling from the glacier shortly after we arrived. 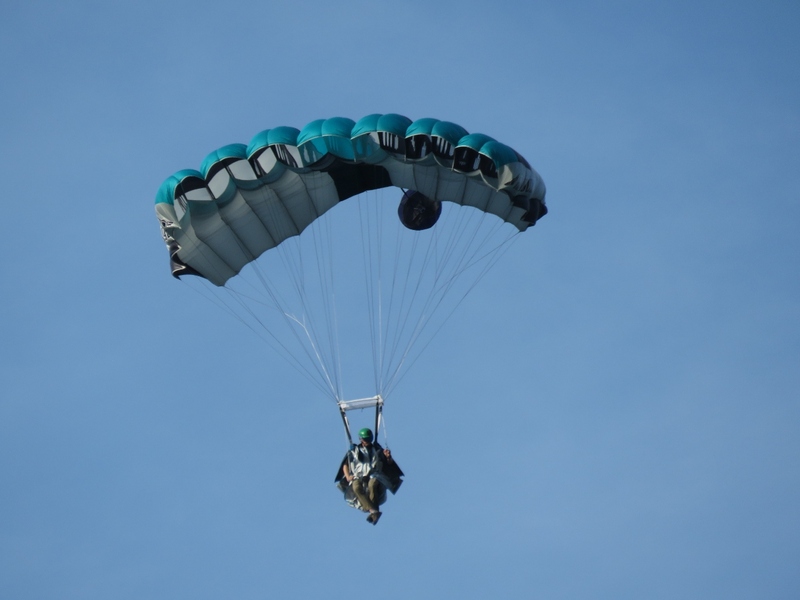 We watched carefully for more, but that was the only event while we were there. Enjoying a picnic lunch with a view to Briksdal Glacier. 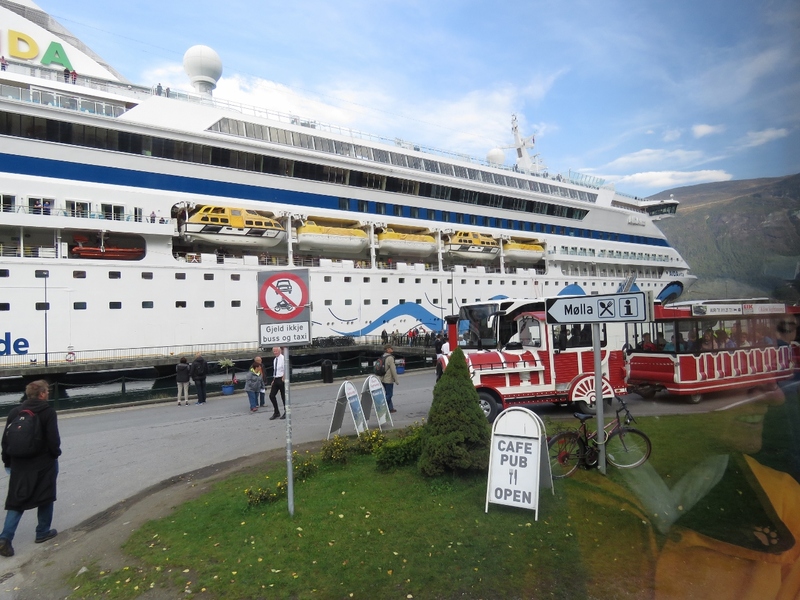 We’d out-walked the cruise ship crowds, but they caught up while we were eating. 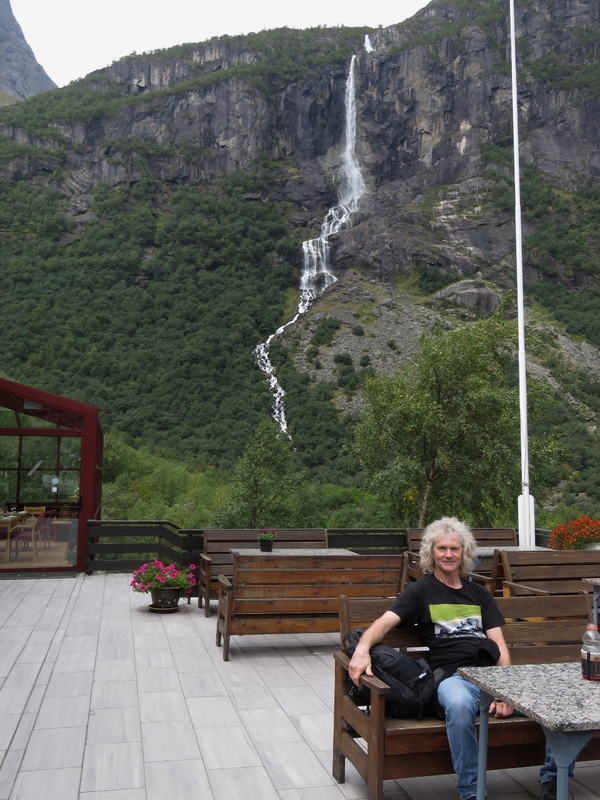 Waiting for our bus at the Briksdal Glacier visitor center with the waterfall Volefossen tumbling down in the distance behind.